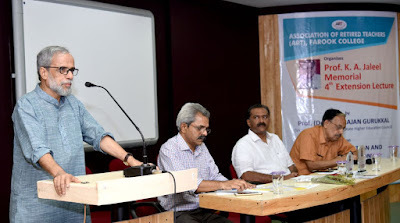 Association of Retired Teachers (ART) organized Prof. K.A. Jaleel Memorial 4th Extensi Lecture on Wednesday, 7 February 2018 at AVT, Farook College. Prof. (Dr.) P.M. Rajan Gurukkal delivered Memorial Lecture on "Higher Education and Globalization". In his speech, there was a logical flow-a clear beginning, middle, and an end catching the full attention of the audience. 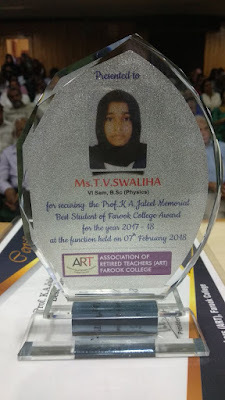 Prof. K.A Jaleel Memorial Best Student Award 2018, instituted by the Association of Retired Teachers (ART), was presented to Ms. T.V. Swaliha (5th Semester, B.Sc. Physics) by Prof. (Dr.P.M. Rajan Gurukkal at this function.